Two big runs in the first and third quarter was enough to bury the offensively-challenged Spurs. Another game, another night of struggles for the San Antonio Spurs. 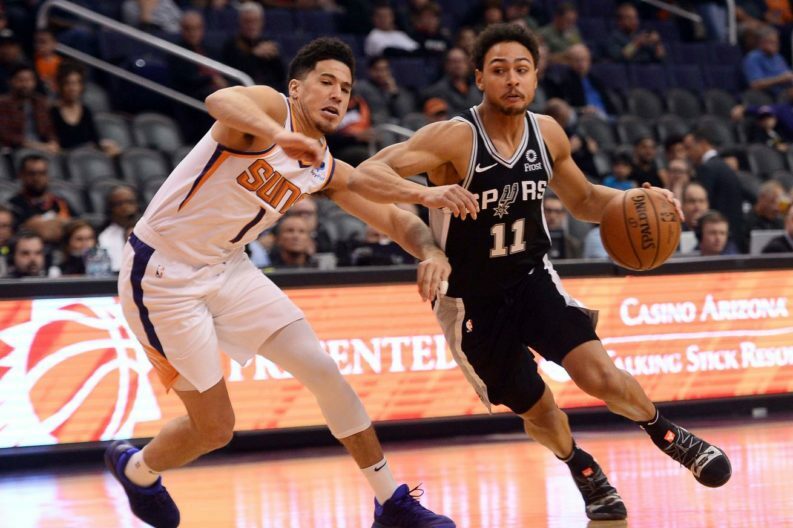 In a game that couldn’t have been any different from their Halloween trouncing of the Western Conference’s worst team, the Phoenix Suns used dominant first and third quarters to blow by a Spurs team 116-96 that has completely lost its offensive identity while cracks in the defense are showing again. The schedule is only getting harder, and letting should-be wins like this waste away are not doing the now 7-6 Spurs any favors. After a slow start, DeMar DeRozan came alive to lead the Spurs with 24 points and 5 rebounds. LaMarcus Aldridge only had 6 points and 12 rebounds, while Derrick White, Bryn Forbes and Marci Belinelli scored in double figures. T.J. Warren led the Suns with 27 points, followed by five other teammates in double figures. Rudy Gay was insistent he could have played tonight as well as the prior games he has missed, but he knows that Gregg Popovich is just looking out for him. With his recent history of heel issues, that’s probably a good idea, especially since the Spurs visit the Clippers on a SEGABABA tomorrow night. The Spurs’ offense started off pretty much where it has left off over the last four games or so. They only shot 29% in the first quarter (6-19) with 6 turnovers, including a near six-minute drought without a field goal. Meanwhile, the Suns came out hot, hitting 66% of their shots in the first while leading by as many as 19 before settling for a 34-19 lead. Speaking of the offense, it seems to run better when DeRozan is the main ball-handler, which in turn makes him more assertive and opens things up for everyone else. Once Gay is back for good and consistently in the starting line-up, it may not hurt to move White to the bench not because he’s playing poorly (quite the contrary), but because it might be worth going back to the starting line-up that, with an exception or two, started the season 6-2 and see if that straightens the offense back out. Then again, the Spurs offense is always going to struggle when Aldridge and/or DeRozan have off nights, so it didn’t help that they started the game a combined 0-11 from the field with neither scoring a field goal until a DeRozan jumper midway through the second quarter. Fortunately that sparked the offense, and they closed the half down just 48-52. The Spurs started the second half much better on offense, but the Suns had an answer every time they got within a score. It didn’t help that Aldridge finally got three shots to fall, only for each to be waived off due the Suns getting away with a defensive goaltend, what appeared to be an and-one being called as a foul on the floor, and a lay-up being waived off due to a three-seconds violation. The momentum turned there, and the Suns took advantage, closing the quarter on a 25-10 run, spearheaded by 10 points from old Spurs-killer Jamal Crawford. Down 87-70 going into the fourth quarter, it felt like Pop might waive the white flag there, but he gave his starters one last chance to respond and make it a game. They didn’t, and Pop finally threw in the towel with 7 minutes left in the game to save his stars for tomorrow. If one role player had himself a nice game, it was Forbes. He kept the offense alive in the first half with all 13 of his points and played some excellent defense on Suns’ leading-scorer Devin Booker, who ended the night with 11 points, only three of which came with Forbes guarding him. For the Suns fans’ perspective, visit Bright Side of the Sun. As previously mentioned, the Spurs are now headed to Los Angeles to take on the Clippers tomorrow night. Tip-off will be at 9:30 PM CT on TNT.